The data provided are annual land cover projections for years 2005 through 2095 generated by the Global Change Assessment Model (GCAM) Version 3.1. For the conterminous USA, the GCAM global gridded results were downscaled to ~5.6 km (0.05 degree) resolution. For each 5.6 x 5.6 km area, the annual land cover percentage comprised by each of the nineteen different land cover classes/plant functional types (PFTs) of the Community Land Model (CLM) (Table 1) are provided. Results are reported for GCAM runs of three scenarios of future human efforts towards climate mitigation as related to global carbon emissions, radiative forcing, and land cover change. Specific scenario conditions were 1) a reference scenario with no explicit climate mitigation efforts that reaches a radiative forcing level of over 7 W/m2 in 2100, 2) the 2.6 mitigation pathway (MP) scenario which is a very low emission scenario with a mid-century peak in radiative forcing at ~3 W/m2, declining to 2.6 W/m2 in 2100, and 3) the 4.5 MP scenario which stabilizes radiative forcing at 4.5 W/m2 (~ 650 ppm CO2-equivalent) before 2100. These downscaled land cover projections can be used to derive spatially explicit estimates of potential shifts in croplands, grasslands, shrub lands, and forest lands in each future climate scenario. Data are presented as three NetCDF v4 files (.nc4), one for each future climate scenario -- 2.6 MP, 4.5 MP, and GCAM reference). Figure 1. 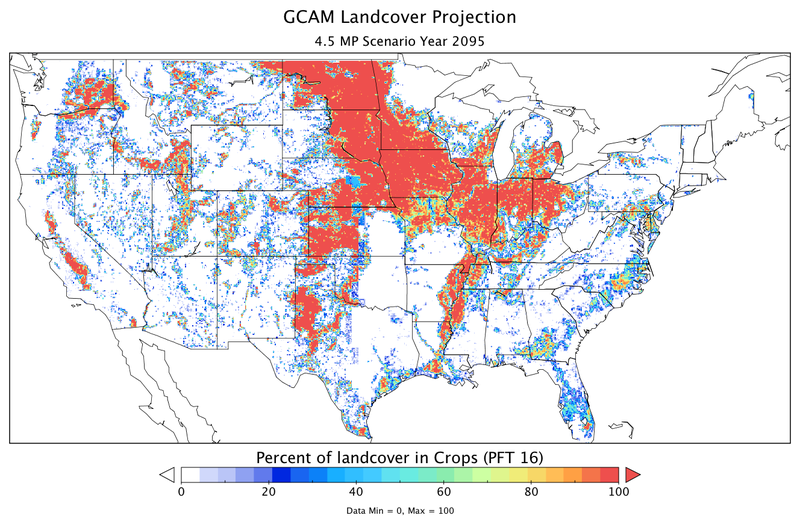 GCAM landcover projection for crops (PFT 16) in year 2095 under the 4.5 MP scenario. Investigators: West, T.O. and Le Page, Y. The Carbon Monitoring System (CMS) is a forward-looking initiative designed to make significant contributions in characterizing, quantifying, understanding, and predicting the evolution of global carbon sources and sinks through improved monitoring of carbon stocks and fluxes. The data provided are annual land cover projections for years 2005 through 2095 generated by the Global Change Assessment Model (GCAM) Version 3.1. For the conterminous USA, the GCAM global gridded results were downscaled to ~5.6 km (0.05-degree) resolution. For each 5.6 x 5.6-km area, the annual land cover percentage comprised by each of the nineteen different land cover classes/plant functional types (PFTs) of the Community Land Model (CLM) (Table 1) are provided. Data are presented as three NetCDF v4 files (.nc4), one for each future climate scenario (2.6 MP, 4.5 MP, & GCAM reference). Each file contains land cover information for 91 years (2005 - 2095), in 0.05 x 0.05-degree grid cells over the continental USA. Data for each grid cell and year include the land cover percentage comprised of each of nineteen different land cover classes or plant functional types (PFTs), corresponding to the Community Land Model (CLM) PFT land cover classes (Table 1). Grid cells with no data (fill value or missing values) are represented by -1. Land cover percentages have a scale factor of 100; such that dividing the raw data values by 100 provides the actual percentage value for each land cover class ranging from 0 to 100%. Note that some grid cells do not total to 100% because they are on US or ocean borders. Table 1. PFTs and land cover classes used in this data set. Grid cells at 0.05 x 0.05-degree (~5.6-km) resolution. The data set covers the period 2005/01/01 to 2095/12/31. Annual (assumed to represent the midpoint of each year). These downscaled data can be applied to analyses of environmental impacts at sub-regional and landscape scales and may provide relevant insights into the potential impacts of socio-economic and environmental drivers on future changes in land cover. Uncertainty in the model downscaling procedure was evaluated by comparing model projections for years 2005 - 2010 against historical land cover change in the US using MODIS PFT data and national inventory statistics. An evaluation of the downscaling method indicates that it is able to reproduce recent changes in cropland and grassland distributions (West et al. 2014). No formal statistical uncertainty is associated with the data set. GCAM is a global integrated assessment model of human activities that contribute to greenhouse gas emissions (Kim et al., 2006 and Clarke et al., 2007). Downscaling GCAM land projections to a gridded land realization requires baseline land cover data, reconciliation of land classes among datasets, reconciliation of land areas among datasets, and final spatial distribution of projected land cover. Data inputs for downscaling and methods of reconciling and distributing land class areas are described below. The MODIS (MCD12Q1) version 5.1 land cover product using the Plant Functional Type (PFT) Type 5 classification at 500m resolution for year 2005 was gridded to 0.05 degree resolution for use as baseline land cover data. Three scenarios of future human activities, including land cover change, were generated with the GCAM model version 3.1, and used here: 4.5 MP, 2.6 MP and a reference scenario. The two mitigation pathways (MP) are defined by their radiative forcing in the year 2100 (i.e., 4.5 and 2.6 W/m2) and are based on the Representative Concentration Pathways (Moss et al 2010) used in CMIP5 (Taylor et al 2012). Recategorization of land classes from GCAM to MODIS requires reconciling of land categories (see West et al. 2014, Table 1). Reconciling land areas is also necessary and is completed for the initial base year and then for each subsequent year. The GCAM first begins with total land area per Agroecological Zone (AEZ) region (Kyle et al 2011) and then simulates changes in land areas per AEZ over time. In order to maintain consistency with the GCAM modeling framework, downscaling of GCAM land areas must be consistent with land areas used in GCAM over the simulation period. The method used here first compares GCAM land area with MODIS land area, based on reconciled land classes, and then adjusts MODIS PFT land areas to represent areas of respective GCAM land classes in the base year and in future years. MODIS land area is adjusted per land class within each AEZ, based on spatial distribution rules. The spatial location of land change per land class and per AEZ is determined by the density and distance of each land class relative to each grid cell. For example, if croplands are expanding or contracting, they will do so according to the density of existing agricultural lands over the landscape. A density-weighted distance index, or kernel density, was generated for all PFT classes and for each grid cell independent of AEZ boundaries (see West et al. 2014, Figure 3). When multiple land classes are changing simultaneously, a predetermined hierarchy of land cover change determines the order of land cover change. For example, agriculture will displace grass, shrub, and forests in that order. The reverse is true for an increase in forest land. This hierarchy represents the relative cost of land cover change associated with each PFT. While GCAM runs on a 5-year time step, here land cover change is interpolated linearly and annually for non-simulated years, thereby enabling annual gridded land realizations. Following the spatial distribution of land areas into MODIS PFT land classes, a climate dataset consisting of monthly mean precipitation, temperature, and annual growing degree days (New et al 2002) was spatially superimposed on the land to further disaggregate land classes into temperate, tropical, and boreal climate regions. The climate classes are assigned following the method applied by Bonan et al (2002) and subsequently result in a combination of land classes and climate regimes that coincide with those used by the CLM (Oleson et al 2010). Bonan, G.B., S. Levis, L. Kergoat, and K.W. Oleson. 2002. Landscapes as patches of plant functional types: an integrating concept for climate and ecosystem models. Glob Biogeochem Cycl 16: 5-1 - 5-25 doi: 10.1029/2000GB001360. Clarke, L., J.Edmonds, H. Jacoby, H. Pitcher, J. reilly, and R. Richels. 2007. CCSP Synthesis and Assessment Product 2.1, Part A: Scenarios of Greenhouse Gas Emissions and Atmospheric Concentrations. U.S. Government Printing Office, Washington, DC. Kim, S.H., J. Edmonds, J. Lurz, S. Smith, and M. Wise. 2006. The ObjECTS framework for integrated assessment: hybrid modeling of transportation. Energy Journal 27: 63–91. Kyle, G.P., P. Luckow P, K.V.Calvin, W.R. Emanuel, M. Nathan, and Y. Zhou. 2011. GCAM 3.0 Agriculture and land Use: Data sources and methods. PNNL-21025 (Richland, Washington: Pacific Northwest National Laboratory). Moss, R. H., J.A. Edmonds, K.A. Hibbard, K A, M.R. Manning, S.K. Rose, D.P. van Vuuren, T.R. Carter, S. Emori, M. Kainuma, T. Kram, G.A. Meehl, J.F.B. Mitchell, N. Nakicenovic, K. Riahi, S.J. Smith, R.J. Stouffer, A.M. Thomson, J.P. Weyant, and T.J. Wilbanks. 2010. The next generation of scenarios for climate change research and assessment. Nature 463: 747-756. New, M., D. Lister, M. Hulme, and I. Makin. 2002. A high-resolution data set of surface climate over global land areas. Clim Res 21: 1-25. Oleson, K.W., D.M. Lawrence, G.B. Bonan, G. Flanner, E. Kluzek, P.J. Lawrence, S. Levis, S. C. Swenson, P.E. Thornton, 2010. Technical description of version 4.0 of the Community Land Model (CLM) NCAR/TN-478+STR (Boulder, Colorado: National Center for Atmospheric Research). West, T.O., Y. Le Page, M. Huang, J. Wolf, and A. Thomson. 2014. Downscaling Global Land Cover Projections from an Integrated Assessment Model for Use in Regional Analyses: Results and Evaluation for the US from 2005 to 2095.Earth Interactions. In press.